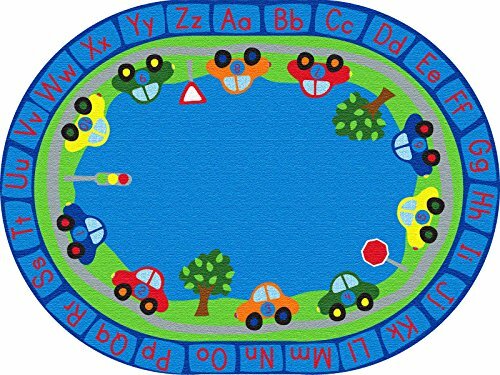 Identify letters and numbers as you follow cars around town on this colorful activity rug from ECR4Kids. Children can practice their ABC's while having a comfortable and fun place to sit. Ideal for daycare, preschool, classroom, and home environments, this commercial quality rug is constructed using the highest density nylon fiber (invista type 6.6, continuous filament), and it features tightly bound, double-stitched edging for maximum strength and durability. The backing features a high-performance Action Bac system for skid-resistance to keep rugs safely in place. A Scotchguard stain protector is applied, and rugs are treated with Force5 anti-microbial agent to shield against odor, mildew, and mold. Printed using a state-of-the-art digital technology (645 DPI with 16-color print capability), ECR4Kids rugs feature the richest, most vibrant, and crisp images in the industry. ECR4Kids rugs are CRI Green Label Plus Certified for the lowest emitting carpet, adhesive, and cushion products on the market. They also have a Class 1 flammability rating. With a concentration on the Pre K-12 sector, ECR4Kids offers a wide range of products including classroom tables and chairs, preschool rest time solutions, hardwood storage cases, blocks and manipulative, mobile organizers and a variety of indoor and outdoor play structures.